DogAbility’s mission is to provide innovative canine-assisted experiences, using certified activity therapy dogs with skilled handlers that afford stimulation, encouragement and entertainment to better the lives and well-being of children and adults of all abilities in the community. 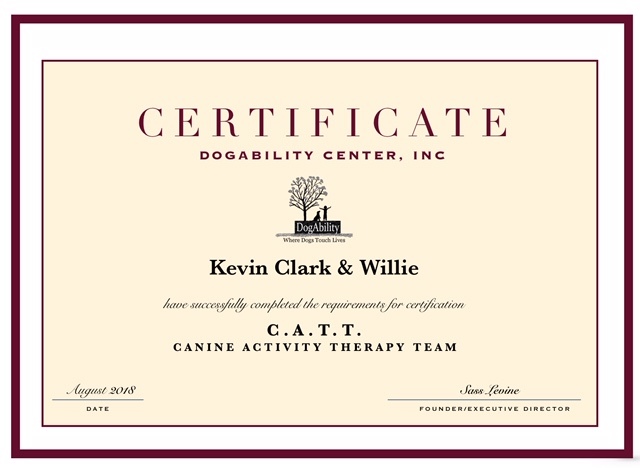 A DogAbility certification recognizes those who have completed the requirements of the canine team preparation process and have demonstrated that they are reliable and committed to the organizations mission. NOTE: This certification is only valid while working in the DogAbility program. You and your dog must PASS an initial team evaluation that enables us to determine if your dog's temperament, energy and impulse control, as well as your handling skill, social confidence and availability are suitable for the DogAbility program. We will spend approx 15 minutes visiting with you and your dog and providing we don’t see any immediate RED FLAGS that would result in immediate dismissal, we then ask that you REMAIN and attend the participant session that is scheduled along with your evaluation. This allows us to observe you and your dog in an actual session and how you function as a "team". NOTE: Excessive barking, trembling, growling or showing any signs of aggression towards people or other dogs is cause for dismissal AT ANY TIME! Remember: It is important that your dog ENJOYS being at DogAbility! Providing you pass your initial team evaluation, you will then be asked to attend 4 consecutive TRAINING CLASSES held on either Sundays or Mondays at 10:00 AM. During team preparatory sessions, you and your dog will be introduced to the many activities we offer during a session with participants. These activities include obstacles, tricks, wagons, games, and canine care education. While attending the training classes, you will also be expected to attend 4 supervised sessions with our participants. You may view our session calendar and choose these dates/times that work best with your schedule. Sessions are usually held 7 days a week which makes it easy to choose a day and time. This offers BOTH parties the opportunity to determine if you and your dog are a good match for the program. During both private and group supervised sessions, you will learn how to manage your dog as you engage with our participants. During these sessions you will be introduced to our session rules and procedures. Since you cannot learn all there is to know in 4 preparatory sessions, we encourage all teams to continue to attend as needed as long as you maintain an active membership. This is a combination of a written assessment as well a a demonstration of skills that you and your dog have learned during your two months of training and session experience. You will let us know your general availability such as weekdays or weekends, mornings or afternoons. You will be included in a list of certified teams who are individually emailed invitations to specific sessions as well as being given access to our google calendar of sessions. You are required to attend 2 participant sessions per month during a year of membership. You will respond by clicking YES or NO to each invitation you receive. Some sessions are with individuals and others are with groups. Our participants come to us through therapists, schools, agencies, clubs or parents. Some sessions are in the morning while others are in the afternoon. Some sessions are on weekdays and others on weekends. You will also be able to view our online session calendar by logging in with an ID and password. All teams are to arrive 1/2 hour prior to each group session which last 1 hour. All teams are to arrive 15 minutes prior to each private session which last 1 hour. Please include your phone number so we may contact you. We hope to see you at DogAbility Center in the near future!